To put an explanation of active investment strategies into context, we first need to look at a benchmark we can compare it to – it is passive or buy-and-hold investing. Passive investing is a great method on paper and for a large part of the investment community following along a broad market index is the only sensible thing there is. In reality, however, human emotions often wreck the entire idea. I do think the move towards passive index investing in recent years is great, because it battles against another idea that is responsible for the major catastrophes in individual investors portfolios: discretionary (intuitive, no-rules) stock-picking. We want to participate in global economic growth and, because we do not know where the best return for our money will be in the future, we invest across the entire financial market. The financial market is global and consists of different asset classes, the main of which are: stocks, bonds, real estate and commodities. This process of diversification, a so-called global asset allocation portfolio, ensures that we spread the risk of loosing money around – many business ventures fail, economies shrink periodically and much of the money invested in these will be lost. Overall we are convinced that risking our money will make it grow, because we are investing in businesses and economies that thrive over the long term. If we couldn’t expect to earn a return for taking such risks, nobody would invest in the first place and free market economies, as we know them, would collapse. Passive investing returns (often called “risk premia”) are the basis of almost all investment strategies. Invest your capital and your future savings (automated, if possible) in a diversified global asset allocation portfolio. You can buy a single exchange-traded fund (ETF) or use a Robo-advisor. That’s it – never look at it again. Euphoria, when everyone talks about investing (often about a specific area: internet stocks, bitcoin, etc. ), causes many people to deviate from their passive portfolio and unconsciously take on a lot more risk in these investments-du-jour to get rich quicker. Invariably you will see losses of more than 75% in these hyped securities at some point in the near future. That is one major reason why I think systematic (using exact rules), active investing is the better practical choice. If you are willing to do the necessary work diligently, it can keep our emotions in check. What is Tactical (Adaptive) Asset Allocation? Tactical or adaptive allocation strategies use systematic rules to time the market in an effort to improve on a passive portfolio. They mostly concentrate on protecting a portfolio against very large losses and to a lesser degree use measures aimed at increasing returns. If there are reliable methods, that enable us to move to the sideline during large bear markets without hurting our bottom line, it would be vastly preferable to use them, because we can avoid falling prey to our behavioral biases. I don’t accept the mantra of the buy-and-hold investing community, that market timing is impossible. There simply is too much evidence against that. We have seen, that there is no such thing as a real-life passive investor anyway (almost everyone unwittingly times the market), so we might as well make the best of it and try to figure out where likely advantages can be found. The mainstream conviction is founded on the premise that predicting the future consistently is impossible – a premise I fully agree with. But an active strategy doesn’t need to predict where future great returns will be coming from – avoiding large losses is enough to gain an advantage, the upside will take care of itself. And predictions are not necessary to successfully protect our investments from downside extremes – market conditions are not completely random, but persistent enough to make this possible over the long term. We simply have to look at what is very closely and position our portfolio accordingly. On the other hand persistence cannot be indefinite – asset prices can become extreme, but not stay that way forever. Over time asset prices are aligned with the growth of financial markets – this average growth is like a magnet they eventually return to. Where is the evidence of non-random, persistent market forces? Many studies (“Value and Momentum Everywhere” authored by academics associated with the hedge fund AQR gives an in-depth overview) highlight two phenomena that show up consistently – momentum and mean reversion. They are like the Yin and Yang of financial markets, that pervades nearly everything. Often a physics analogy is used to visualize the intertwined process: an object in motion stays in motion until a new force comes into play, but this motion in itself carries the seed of an opposite force, like a rubber band that stretches more and more until it finally snaps back. Momentum or trend have been shown to stay persistent between 3 to 15 months, while mean reversion is strongest over 3 to 5 year time horizons. it takes less risk with lower volatility and drawdowns than a buy-and-hold investment in the global market portfolio. If you search for such strategies you will find a majority of methods that employ momentum (called trend in its simple form) as their main mechanism: when the asset class price begins to fall, the strategy defines a point at which to reduce or get out of the investment in that asset class. When it starts to rise again significantly, we re-invests in that asset. Alternatively the trend of fundamental economic development can be used successfully in the same fashion – is the economy shrinking or growing? A 15-year backtest of our Meta Strategy Defensive ETF Portfolio (in red – click chart to enlarge) shows the advantages distinctly: Losses in the worst bear markets are reduced, while overall returns are improved. The strategy earned about 1% more annually than a buy and hold investment in the S&P 500 (grey) and the ride was a lot smoother, avoiding the sleepless nights of 2008/09. Another popular investment strategy, that is used by many of the world’s best long-term investors (Warren Buffet is just one example), captures the persistent phenomenon of reversion to the mean: value investing. Over longer time horizons (above three years) we can expect that relatively cheap assets outperform those that are expensive. Value and several other factors (e.g. size, quality, low beta, illiquidity and others) have been shown to be the main components that make up stock market returns. Filtering individual securities (e.g. single stocks) by such factors is another way to tactically allocate a portfolio – this has recently become popular under the catch-all phrase „Smart Beta“. Instead of getting in and out of whole asset classes, these strategies stay invested in the market and continuously shift their allocation to securities displaying the desired characteristic. Warren Buffet´s performance, for example, can be explained almost entirely by the factors value, quality (stable, profitable companies) and low beta (stocks that move less than the market) – with some leverage (for each dollar he had, he actually invested $1,76) added to boost returns. 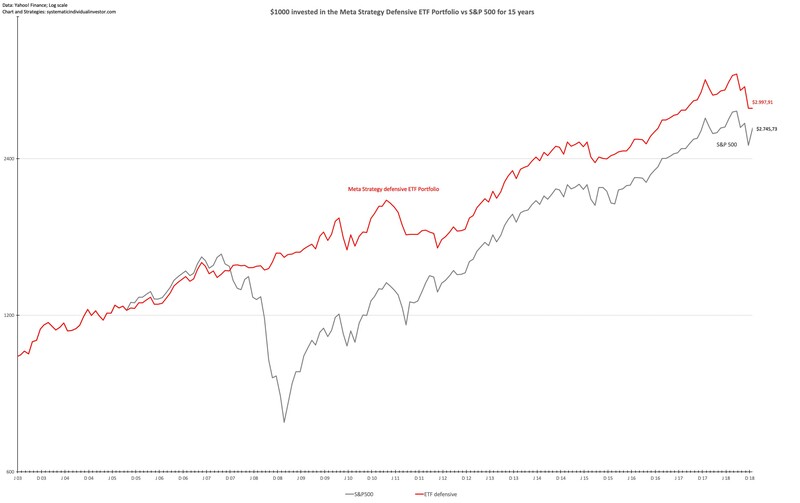 The problem with staying in the market, no matter what, is: if the market as a whole goes down, smart beta strategies go down as well and drawdowns (losses from the peak) will be very similar to a passive portfolio. Factor investing essentially equals buy-and-hold with an active tilt towards securities with characteristics, that led to an outperformance historically. Because I want to avoid being part of the big bear markets all asset classes go through periodically, I have narrowed down to using momentum measures in combination with economic fundamentals to build my own tactical model: The Meta Strategy. The best strategy is one that you can stick with in practice. This is actually the hardest part about investing (finding a good strategy is not really all that difficult) and we have seen that a good strategy, e.g. passive investing, can be jeopardized by investor´s inability to stay with it. That’s why it is very important to know what to expect and to write down your exact strategy (including expectations) in an investment plan (Register or subscribe here to read a detailed description of how to do this in “The Investment Blueprint”, my free eBook). You have to find a good strategy that fits you and that you trust, to be able to invest in a disciplined way over a long period of time and be successful. In general, for all active investment strategies, times of out- and underperformance will take turns. That is what makes it hard to stick to a strategy over the long term – in prolonged phases of underperformance the tendency to throw in the towel is very high. This is true for all tactical strategies as well as passive investing (which simply looses a lot periodically) – none of them is magic. Return and risk are intertwined and you cannot make risk disappear. If you see a “holy grail“ strategy, that professes to do that, you are most likely looking at a Bernie Maddoff type of ponzi scheme. Where does the outperformance come from? On a day-to-day basis any tactical strategy will track the indices it is currently invested in 1 : 1 – it can never outperform them. It simply aims to earn higher risk-adjusted returns over the long run by losing much less in the really bad bear markets. Because in practice there are bound to be some wrong signals, most strategies will actually underperform the stock market in a bull market. Some strategies mitigate this problem by investing in the asset with the greatest relative strength (e.g. by selecting the asset with the biggest return over the last year compared to all others). Historically this strength has lead to continued better returns – by concentrating their portfolio in these assets investors take an additional risk and have been compensated for that over time. Maybe the most important thing to realize is, that a tactical strategy will never get you in at the bottom or out at the exact top. It doesn’t even try to as it reacts to developments and adapts accordingly – leading to an exit that usually occurs sometime after the asset class tops, but before it enters a really deep decline. A technical indicator signaling a trend change will trigger a certain exit after the market high by definition – a trend must be broken at some time whenever it changes direction and that can never occur before the high or low. This certainty is very valuable and makes for a good timing signal, but the downside is, that warning signals are actually wrong the majority of the time (around 60% for most trend-following strategies). This may lead to many small, but frustrating, whipsaw losses, when a trend change is signaled, but the original price direction quickly resumes after a temporary drop. Being wrong so often will quickly erode the discipline necessary when following the strategy – we might disregard the one signal warning of a major bear market. The details and methods of exactly how to measure trend are diverse, but rules are widely available and not very complicated. Most importantly all methods work in a similar way and it doesn’t really matter which one to use: if there is a trend they will all signal it. A measurement for the yearly trend (e.g. comparing the price change from one year ago to today’s price or comparing an asset´s price to its 200-day moving average) can be expected to trigger an exit signal between 10% and 20% from the top – depending on the speed of the decline. Differences in results are essentially due to random luck. Fundamental analysis, on the other hand, is quite good at correctly assessing the state of the economy, with leading indicators pointing at the current trajectory of economic development. This is very valuable as the economy is what fundamentally drives asset prices, but other factors may override this basic drive temporarily, causing price changes to deviate from economic development. Fundamental indicators are very fuzzy when it comes to actually timing entry and exit decisions. Signals may lead or lag actual price changes a lot and, worst of all, are not certain to occur – a bear market may happen without a signal warning us about it. This chart shows the S&P 500 with all declines around 30% or greater marked in yellow and recession periods in grey. Several smaller recessions at lower equity valuations led to a stock market decline of less than 30%, while only one 30%+ decline happened outside of a recession: the crash of 1987, an outlier event that was foreshadowed by preciously little solid data. In the Meta Strategy I use both technical and fundamental indicators to combine certain protection with a correct assessment of economic reality. You can follow how I invest according to the Meta Strategy in my own portfolio by subscribing to my newsletter here – it includes a defensive and an aggressive ETF model portfolio with all the ticker symbols and other details for US as well as EU investors. I have introduced a new „easy read“ category aimed at an interested beginner audience, who want to gain more control over their investment process (or start investing in the first place). I explain basic investing ideas, that often challenge mainstream beliefs, in a simple, detailed way – ideas that, I am convinced, can add a lot of value for individual investors.